We are delighted to announce the publication of a further volume in the SPERI series ‘Building a Sustainable Political Economy: SPERI Research and Policy’ published by Palgrave Macmillan. The author is Valbona Muzaka, Honorary Research Fellow of SPERI and Senior Lecturer in International Political Economy at King’s College, London. 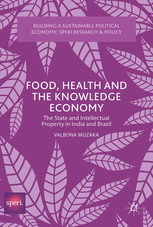 The book is entitled: Food, Health and the Knowledge Economy: The State and Intellectual Property in India and Brazil. The book opens a window into how two ambitious countries – India and Brazil – are seeking to become knowledge powers in the 21st century. As the knowledge economy became the preferred way of conceptualising the economy and its future direction in the more economically-advanced countries, our search for understanding also followed the same direction. This generated a body of work that has neglected countries that, like India and Brazil, are attempting to make the leap into knowledge economies. Valbona Muzaka explores these motivations and the ways in which they have inspired a number of institutional reforms in India and Brazil. She offers an investigation of the role of the state in shaping the respective intellectual property systems pertaining to the pharmaceutical and agro-biotechnology sectors and the multiple social conflicts that have unfolded as a result. Eduardo Albuquerque, Universidade Federal de Minais Gerais, Brazil. The book can be bought in hard copy or as an e-book here.